Lunch with Bill Smith, chef at Crook's Corner and author of "Seasoned in the South." That's $29 for a three-course lunch from noon-2 p.m. Oct. 11 at Crook's. It's included for workshop participants. 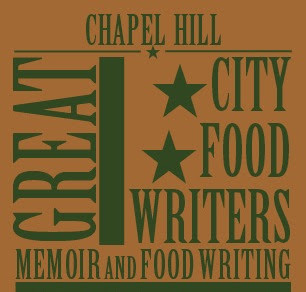 Two publishing panels, including cookbook authors and possibly editors, at Fearrington Village at 4:30 p.m. Oct. 12. A family-style, multicourse dinner at Lantern with chef Andrea Reusing at 6 p.m. Oct. 13, for $95. The extra events are expected to sell out quickly, and time also is running out to sign up for the workshop. Go to www.floatingislandwritersworkshops.com for full details and registration forms. If experience is any indication, I know what will happen the Saturday after Labor Day: The crowds at the local farmers markets will slow to a trickle, like somebody turned off a faucet. I understand the problem: School is back in full swing, soccer leagues decide that 8 days a week isn't too often for your kids to be at practice, and buying seasonal, local food doesn't seem as pressing once the peaches and corn ease up. Pity: The fall growing season around here is one of the best. The heat lets up -- a little! -- and we start to get things like apples from the mountains, greens and late-season tomatoes. Lots of local meat, of course, although the chicken farmers start to warn that they're coming to the last batches for the year. The Matthews Community Farmers Market is months away from its winter schedule. But it will have shorter hours just for the Saturday of Labor Day weekend (that would be Sept. 4) because of the Matthews Alive! Festival. It will open 7:15 to 9 a.m. only on that Saturday. Also, it's time to buy tickets to the Matthews market's annual barbecue, 5-7 p.m. Sept. 28. A $12 ticket gets you barbecue made by chef Alex Ranucci using Grateful Growers pork, and side dishes and desserts made by local chefs. I've gone before and I can tell you that tickets sell out fast for a good reason. Get tickets at the market's Community House during market hours, or at Renfrow's Hardware, just a couple of doors up the street, at 188 N. Trade St.
What's wrong with that picture? Well, the egg looks moist and delicious with a yolk that is runny and perfect for dipping in a corner of buttered toast. Food editors who swap messages on a list serve were chattering Monday about the Food & Drug Administration's latest announcement in the massive shell-egg recall: Cook your eggs until they are hard and the yolks are dry. For those of us who were around in the 1990s, that's a return to business as usual. I had the luck to start covering food in the summer of 1990, when the first cases of salmonella contamination in eggs erupted just a few weeks after I was assigned to the beat. I had barely figured out how to spell "FDA" and I was trying to explain to people how to make custard-based ice cream without raw eggs, and what to do with their Hollandaise and mayonnaise recipes. In the 20 years since then, I've learned to type this one by rote: "Uncooked eggs can be dangerous for infants, children, the elderly and those with compromised immune systems." Truthfully, though, undercooked eggs didn't go away. Because they taste good. The American Egg Board issued a statement this morning with this sentence: "Thoroughly cooked eggs are thoroughly safe eggs." Yes, they are. Unfortunately, they are also throughly tasteless eggs, with yolks that taste like library paste and whites that chew like rubber. Over the intervening years since the original egg warnings, most of us found ways to adapt. We either did without dishes made with undercooked eggs, or we found ways to minimize the risk. For myself, I started buying eggs from farmers who produce them in small batches, because there is less risk of contamination. Unfortunately, I also had to get used to paying $5 for a dozen eggs. Yes, they're great eggs, with tall, dark-yellow yolks, but they're not exactly a cheap indulgence. produced on large-farm operations, where contamination spreads quickly throughout the food system. And means recognizing that those eggs need to be cooked more thoroughly. Don't you think 20 years should have been enough time to come up with a system that's better than telling us the solution to egg contamination is in how we're cooking, not in how we're raising chickens? 1. We all know that a lot of book clubs serve good food. We're looking for a couple of book clubs that tie the theme of the food to the theme of the book. If you know someone in a book club that has done that, let me know. 2. Tailgate season is coming. We're looking for a couple of great tailgaters who can give advice on the tricks they know for putting on a great sports tailgate party. Got someone in mind? Send me your contact information (or a way to contact the person you have in mind) at kpurvis@charlotteobserver.com. Thanks! Eggs laid in Iowa may have cut a wide path through the U.S. food supply. A voluntary recall by Wright County Egg of Galt, Iowa, of certain shell eggs that might have been contaminated with salmonella is up to 380 million. While the eggs weren't distributed in the Carolinas, they were distributed to food wholesalers, distribution centers and food service companies in 16 states that do business nationwide. The recall started as part of an investigation into an increase in cases of salmonella contamination nationwide that was reported earlier this summer. A spokesperson with the N.C. Department of Health said that there was a confirmed salmonella outbreak related to the same strain of salmonella in April. It stemmed from an egg product used in meringue at a Durham restaurant. However, that is the only N.C. connection so far, and state officials have not issued a warning about eggs or egg products in North Carolina. Exposure to the salmonella bacteria can cause serious infections with symptoms that include fever, diarrhea, nausea, vomiting and abdominal pain, and can be particularly dangerous to young children, the elderly, and people with compromised immune systems. While the investigation continues, the U.S. Food & Drug Administration recommends avoiding restaurant dishes made with raw or undercooked, unpasteurized eggs. Restaurants should use pasteurized eggs in any recipe (such as Hollandaise sauce or Caesar salad dressing) that calls for raw eggs. You also should be aware of the symptoms of salmonella contamination. If you think you've gotten ill from eating recalled eggs, call your health care provider. Pimento Cheese: Ready for more? 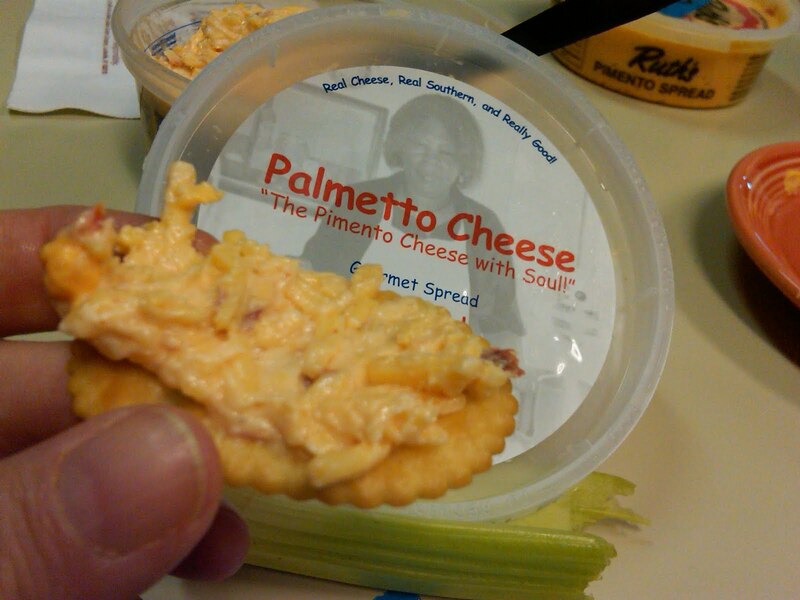 After our recent tasting of three pimento cheeses, Palmetto, Augusta's and Ruth's, readers demanded another tasting. This time, you wanted us to include Stan's, Something Classic and Fresh Market. Did we listen? Of course we did. Did you think we'd miss a chance to eat 'minnow cheese and talk about it? This time, we lined up Palmetto, based on a recipe from the Sea View Inn on Pawley's Island, with Stan's, Something Classic and Fresh Market. Which one came out on top? Tune in tomorrow to The Observer, available in handy printed and online versions (www.charlotteobserver.com/food for online, at the end of your driveway for print) to find out which pimento cheese was the champion. And yes, we'll have a recipe for making your own. No, it probably isn't the one your mom made. But we like it. What did I eat on my summer vacation? I already knew Cleveland has a reputation as a fun town. It's got the Rock & Roll Hall of Fame (just called "the Rock Hall" by most everybody) and it's the home of Big Fun, which has to be the greatest toy store anywhere in the country. Where else can you see an Austin Powers action figure next to an action figure of D-Day from "Animal House" -- both in their original packages? 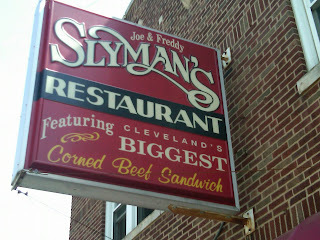 What I didn't realize was that Cleveland may be one of the great food destinations in the United States. Yeah, I said it: New York has pretensions, San Francisco has ambitions. But baby, only Cleveland has Slyman's, Home of Cleveland's Biggest Corned Beef Sandwich. Cleveland isn't the only city with a Little Italy, but this one is strung along a hill going up to Cleveland Heights and it smells like garlic even when we drove through at 9 a.m. one morning. I was touring this cornucopia of delights on a college tour with my high school senior son, who wanted to visit Kenyon and Oberlin. And since his godmother is a writer in Cleveland, we grabbed the chance to follow in the footsteps of the late and still very lamented Harvey Pekar, also a denizen of Cleveland Heights. On Saturday morning, our friend took us to the West Side Market, one of the last great surviving city markets. It was packed with people stocking up on everything from perogies to carnitas. I haunt city markets wherever I go, but this one had more life than even San Francisco's Ferry Market Plaza. There was a jazz band playing on a walkway upstairs, overlooking the whole boiling mass of food shoppers down below. Over that lunch of boxties, my friend, a dedicated vegetarian who lives vicariously by making other people eat meat, offered my son a lineup of Saturday night choices: He could choose between Polish, Hungarian, Slovenian or Russian. Then she gave him a lesson on which is which, based mainly on use of paprika vs. mushrooms. We picked Hungarian and ended up at Balaton in Shaker Square, tucking into big plates of their famous weiner schnitzel and veal paprikash. On the way to the airport, our friend gave us two sets of directions: One, to get to the Rock Hall. The other, how to pass right by Slyman's on the way to the airport to pick up something that would get us through two airports before we would get back home to Charlotte. At the airport, we unwrapped our sandwiches and I measured mine: 4 inches thick, not counting the three slices of rye bread. It's vacation time for me. I'll be away until Monday, Aug. 16, exploring the great state of Ohio and enjoying some at-home time right here in Charlotte, N.C. Maybe I'll finally get that stack of recipes organized. Until then, go cook something you love. Who wins the Ball canning kit? Gretchen, it looks like you won't need that coupon. You're the winner of the canning kit. Send your address to me at kpurvis@charlotteobserver.com and I'll get the kit in the mail to you. Thanks, everyone, for playing. And for all of you who expressed in interest in learning how to can, you're on the right track. It's really not difficult. As my colleague Andrea Weigl reports Wednesday, canning has taken off with a whole new generation of home preservationists. 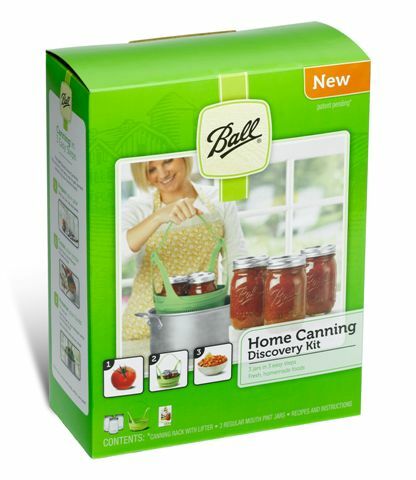 To keep up with the popularity, Ball has a new Home Canning Discovery Kit: 3 jars with lids, a nifty heat-safe canning rack/lifter basket for lifting jars from boiling water, and a recipe book with instructions for pickles, relishes, salsas and a few more specialties you can make easily in a boiling-water canner. To celebrate the smart cooks who are canners, I'm giving away one kit, which retails for about $10. Respond here with a name I can recognize you with, and we'll have a random drawing at the end of the day Wednesday. Don't forget to check back here -- if I can't reach you, I can't send it to you. Certain choices are too personal to mess with: Religion, politics, and pimento cheese. 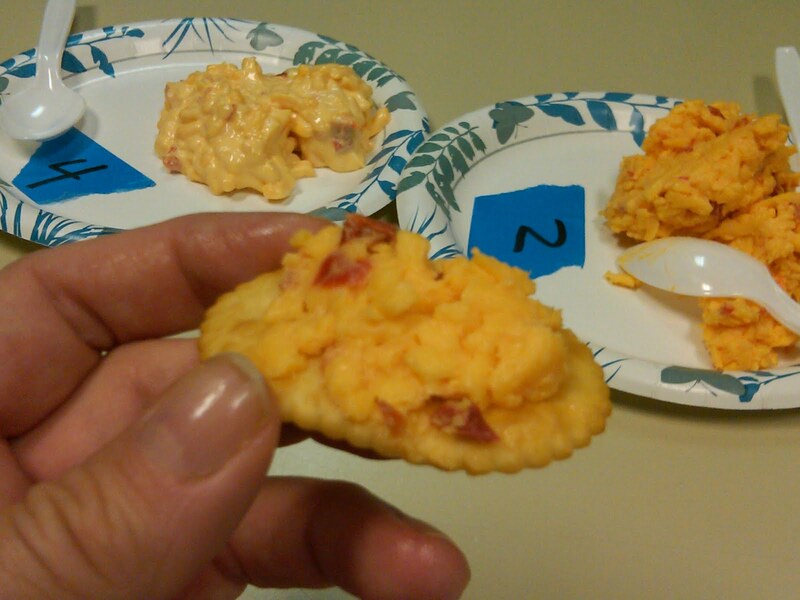 A number of years ago, I did a pimento cheese tasting and I swore I'd never do it again. The pimento cheese you like is the one your mother made, and I never argue with a person's mother. But never say never. I've been hearing about a couple of newcomers in Harris Teeter recently, Charlotte-based Augusta's and the cleverly named Palmetto Cheese from Pawley's Island. When co-worker Shannon Crisp stated ranting about her addiction to Palmetto, I thought it was time to give them a try. I arranged a blind-tasting of Palmetto, Augusta's (both in the original or non-jalapeno form) and the venerable Ruth's Pimento Spread, made in Chester, S.C. Then I pulled together two avowed 'minter cheese addicts, Crisp and writer Olivia Fortson. As the person who covers parties, Fortson knows her way around a dip tray. We put out number-coded plates of all three, along with celery and crackers, and got to work. All three of us choose the same favorite and the same second favorite. We also were able to identify the three correctly. The spreads were that different in taste, texture and appearance. The unanimous favorite: Palmetto Cheese. Besides having a little peppery kick, the shredded-cheese texture impressed us all. That texture made it seem the closest to homemade. "It tastes like my mom made it in her kitchen," said Crisp. "I want to grab a recipe and make things with that." A close second: Augusta's. The texture, we all agreed, was too smooth and creamy. But we all liked the flavor, which was a little sharper with a bit more bite. It would make the best party dip, especially for spreading on celery sticks. Third place: Ruth's, which was declared "too orange and too sweet," with a flavor that reminded us of Kraft Miracle Whip instead of mayonnaise. But Ruth's wasn't necessarily a loser. Crisp noted that it was the kind of pimento cheese she grew up with, and she knows for a fact "it makes the best grilled pimento cheese sandwich." If you still have a beach-house week ahead of you, I'd recommend packing along a tub of both Pawley's and Augusta's. Take plenty of crackers and do your own tasting. Has the economy forced you to branch out -- or are you thinking about jumping into the entreprenurial pool? Warren Brown, founder of CakeLove in Washington, D.C., and media star (he was host of "Sugar Rush" on Food Network and has been on "Oprah" and "Today") will bring his motivation to Johnson & Wales from 7 to 10 a.m. Aug. 11 for the speaker series Accelerating Your Business. Brown's appearance is sponsored by the Charlotte Chamber of Commerce. It's free AND breakfast is included, but you have to register for a spot. To do that, go to http://www.charlottechamber.com/ and search on "Warren Brown." Remember the 10% Local Challenge I wrote about here last week? There's a Charlotte-area kickoff from 11:30 a.m.-1 p.m. Aug. 17 at Atherton Market at Atherton Mill, 2104 South Blvd. Expect chefs demos, food tastings, shopping tips and dietary and nutrition advice, all to help you reach that goal of spending 10% of your food dollars on local food. To learn more, go here. "Southern Cooking: Then & Now" is the subject of the next WFAE Public Conversation, 7-8:30 p.m. Aug. 19 at the charlotte Museum of History. Moderated by Johnson & Wales University chef Peter Reinhart, panelists will be Heidi Billotto, Penny Craver of the restaurant Dish (love your sweet potato pie, Penny! ), and soul food cooking teacher Denise Hairston. And if my own experiences with the Public Conversation format is any indication, audiences get to do a lot of participating.